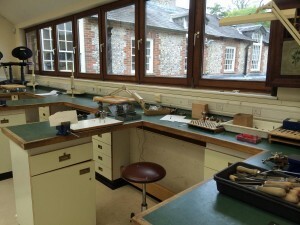 The first of my blogs talking about what we are actually doing in class at West Dean. Our first project is to make a file cleaner–that’s a metal file not a paper file folder type file–strangely enough, making the file cleaner requires a lot of filing. In reality it would not have to involve so much filing but the point is that it is an exercise to spend time learning to use a file. So what’s a file cleaner. For those that haven’t used a file on metals before, they do tend to get clogged up rather easily with little bits of the metal you are filing. It clogs up the teeth and renders the file more or less useless–certainly much less effective. There are commercial file cleaners made that look a lot like pet hair brushes. Well, they should probably remain to be used on pets because they don’t work very well on files. 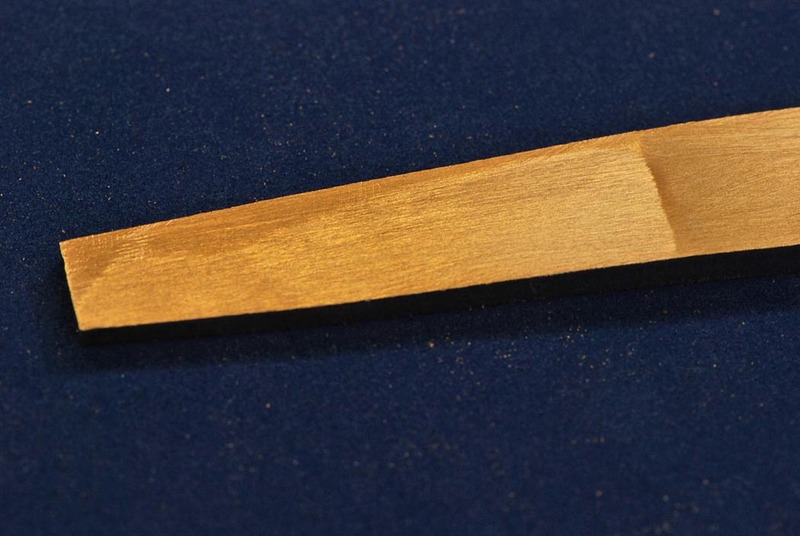 The one we are making is a piece of brass that you rub over the groves of the file and it “pushes” out the little bit of metal that are in the file groves. 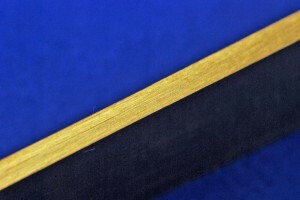 Being made of brass it is relatively soft so the cleaner does not dull the file. 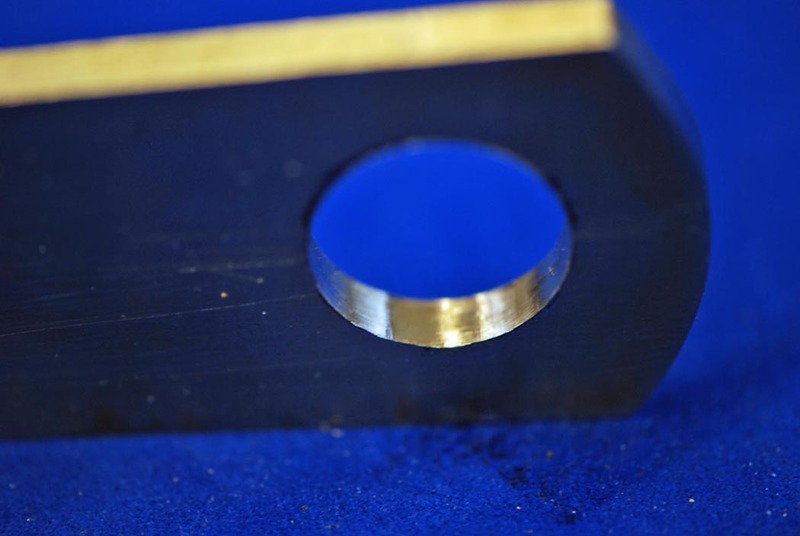 1) Start with a piece of rough cut brass in the basic shape. 2) Cut to rough length – about 6 inches. 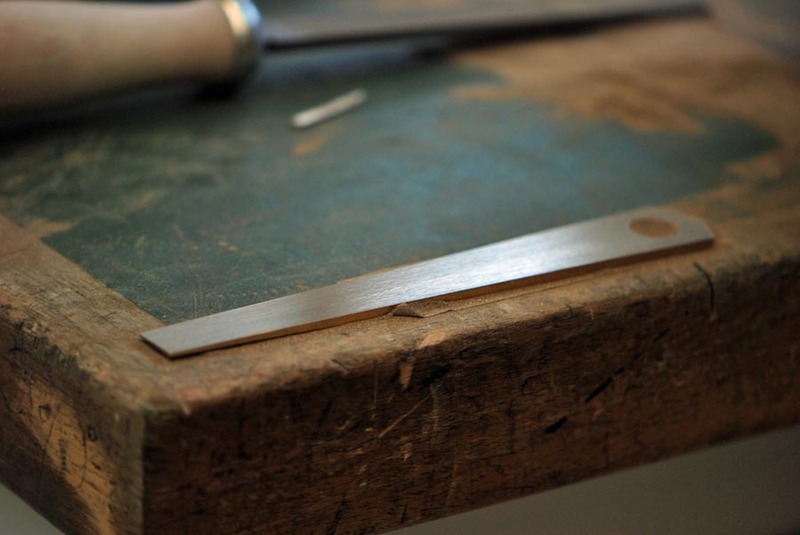 3) File the long edges smooth and straight. This is harder than it looks. Test it against a flat surface. This shiny part is the edge of the file cleaner – about an eight inch thick. 4) File a taper on the end. This is tough. First get rid of material to create the taper. Then take a finer file and work on getting it perfectly flat. When finished, the line joining the taper to the thick part of the file should be perfectly straight and crisp – as you all remember from high school geometry, two flat planes intersect in a line. This isn’t perfect yet but you can see the joint line getting sharper. 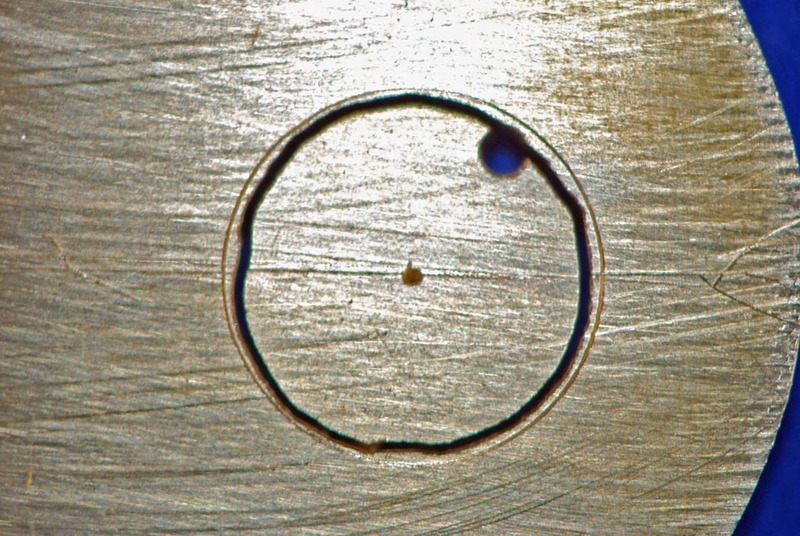 5) Mark a center line to scribe a circle in the end. 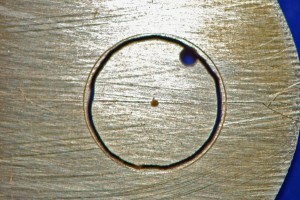 6) Drill a hole within the circle, then take a piercing saw to cut out the hole. I put the piece of brass I cut out back in the hole. 7) Smooth out the inside of the hole with a crossing file and then put a final very smooth finish on it with a smoothing broach. 8) Take a file to the back side of the cleaner to smooth it out and get any rough scratches off. 9) Finally, cut a chamfer on the corners to keep them from cutting your hands and give them a nice comfy feel. Finished! – this is the flat side. 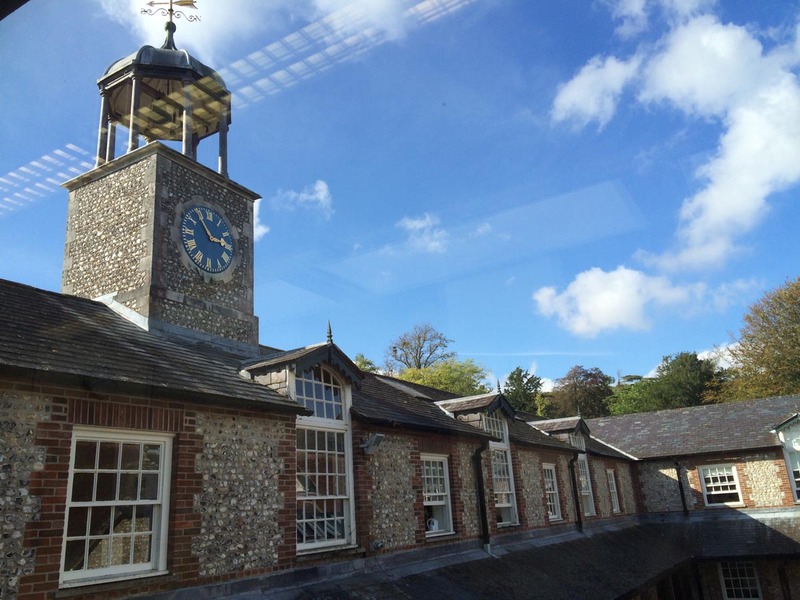 What is West Dean College all about? Yes, West Dean College is a different type of college and so small that not many people have heard of it. Like many things in England it has a history and I was surprised to learn that some of it has an American connection. The College was founded by Edward James (1907-1984). 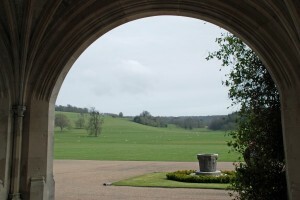 He created the Edward James Foundation in 1964 and the family estate home was opened as the College in 1971. So, I guess you could say that by local standards the College is quite young. The history part relates to his family history–without the benefit of his inherited wealth the college would not be here today. Edward’s father was William James, a wealthy landowner of American decent. His mother, William’s wife, was the daughter of Sir Charles Forbes, a Scottish aristocrat. Unfortunately, William died when Edward was only four and though he inherited his father’s estate, it was held in trust until he reached the age of 25. At that time, the estate was 12,000 acres of land. It has now been reduced to only 6,000! 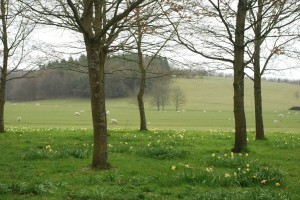 The estate has many houses and pastures as well as woods–in fact, as I found out on a recent small tour, the woods are managed to produce all the firewood necessary to run the heating boiler that keeps all the college buildings, the church, and a number of local homes warm throughout the year. I took this one morning on my way to class – Wow! Edward used his wealth to support the arts and many young artists such as Salvador Dalí, Rene Magritte, and Pavel Tchelitchew, buying their work, which was then, unfashionable. He also wanted to create a community where the estate supports a college dedicated to the arts and crafts. Looking out from the front door. The estate house is a wonderful building, expanded to its present structure by Edwards father in 1892. It is made of knapped, local flint stone. The inside is full of art of all kinds–it looks like a mini-museum with gilded wood panels and columns, big stone fireplaces, tapestries, statues, and a marble staircase. 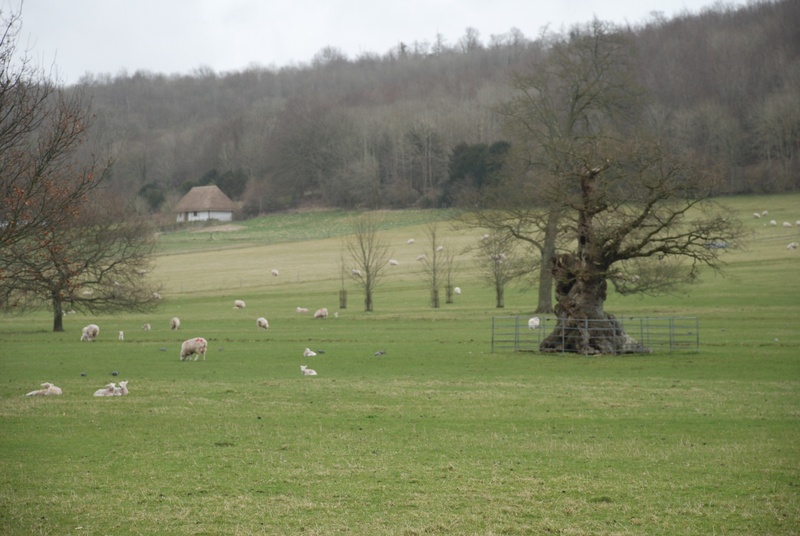 And the outside is just as stunning in many ways – the open fields bordered by woods with the ubiquitous sheep and pheasants. If you want to get a better feel for it – watch this short movie. Here’s the clock end of the building where the clock workshop is. 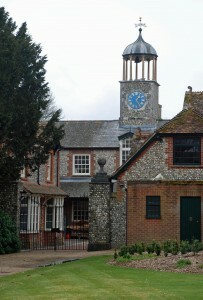 There are about 70 people overall in the full-time programmes at the college and seven in the clocks programme. People come from all over the world to take advantage of this world-class environment and tutoring. My class has a good mix of people including one woman–she’s the youngest in the class (~30) and comes from Germany. Another student comes from the US and all the rest are Brits. 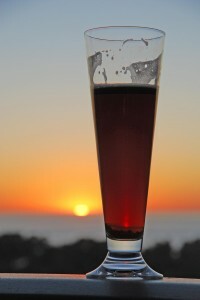 Most of the class is younger than me, forties or fifties, but I do have the company of one about my age. You don’t really need clock experience to come to the program but it helps. The programme is intense and having some of the basics already helps me to be able to learn some more of the subtleties without struggling to grasp the basics. It is not so much book learning as hands-on but there are a lot of details to learn about – so it does take a good brain as well. In addition to learning a making craft, the conservation approach is strongly taught throughout all our work. 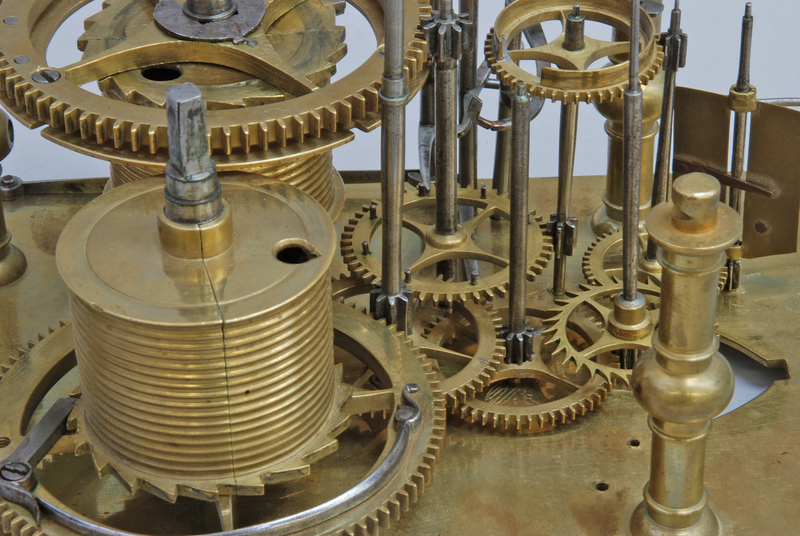 We don’t just repair clocks, we are taught to understand the history and place in history that the objects we work on were part of. We need to understand the techniques used in the making so that we can begin to identify modern work vs “original” work. These clocks are so old that they have been worked on many times throughout the years. 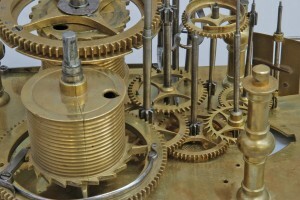 I was working on a clock last week that began it’s life almost 350 years ago! Each day I realize more how well this place fits my interest, skills, and passion. Well, I probably should stop this for now – I am enjoying my course work and the environs here as much as I thought I would. Stay tuned for some more on what I am actually doing in class. It has been a month since I posted last and it is hard to believe that it has been so long. On the other hand, so much has happened in that time. In short, we finally got approval for Debbie to come and stay here for the duration of my studies (in fact she can stay much longer). And, my studies have started. We labored and waited so long, it seems, to get Debbie’s Certificate of Entitlement approved but it finally came through and we got her on a plane and over here ASAP. It was not without drama but within a few days she was landing at Heathrow airport in London. By contrast, her trip through the immigration and customs lines at the airport were super fast, she walked straight through with little interruption. I had gone to get some coffee thinking that I would have a bit of a wait but no sooner was I back to my watching spot and she came through the doors! It was amazing. We only had a two days together before my classes started, in fact the day after she arrived was registration day and that day after that I started my first day. So, for the past two weeks, Debbie has been busy making our new flat a home and I have been getting into my classes. Along with a number of introductory classes on things like learning how to use the library we also got started with initial projects in the workshop. I brought some tools with me also, so I have spent some time getting them setup. My first project has been making a file cleaner. Doesn’t sound too exciting does it. But it is a very good project to learn the skill of using a file. I’ll write something about this later separately so that those of you that will really find it boring won’t have to waste your time on it. View from the window by my workbench. I have been riding my bike to school and back, about 5.5 miles one way. Believe it or not, today is the first time I have ridden through any rain. A couple days I have put on my rain pants expecting to get wet on the way but no rain appeared. The weather here is so variable and changeable in the matter of minutes. Look for some more writing on the ride to and fro but for now, two big impressions from riding – the beauty of the ride and the soreness of my legs. My ride is mostly off road but on a paved path but at least half of it is on a walkway by fields and pastures. Last Friday, I was so impressed by the morning and the sheep in the pasture that I had to stop for a photo. 10 days in and finally sleeping through the night. Jet lag has been overcome, thankfully and I am feeling human again. After such drama and intense anticipation of receiving my certificate of entitlement, immigration was laughable in its casualness! 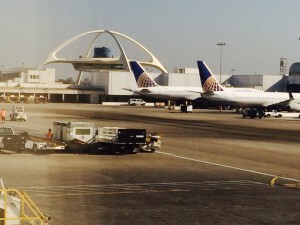 It took me longer to walk from the plane to the immigration station as it did to go through the process! It likely made a difference it was 6:20am and I was able to go through British customs with my new status, so I guess all in all being entitled has its advantages. We have spent a better part of the last week cleaning and organizing our little place. We packed up 5 boxes of the landlords extra stuff, which she kindly removed, so we are finding places for our things and getting used to a new and much smaller existence. A weekend trip to Ikea about an hour away was a mistake, but with patience and perseverance we came away with a new rug, sewing table, and a few other kitchen items, which is making our flat feel more like home. Mostyn is already hard at work at school and enjoys all his other fellow students and tutor. The setting of the school is amazing, just like out of an English novel, complete with fields of sheep and forest as far as the eye can see. He has been riding his new Brompton fold up bike most days, a 45 minute ride each way. He will be quite fit when we return. We feel it was a good decision to be ‘in town’, as opposed to outside the city walls or near the school. Everything we need is literally around the corner. For example, yesterday it was pouring rain and I needed to wash sheets and towels. With no clothes dryer and only a small clothesline on our ‘patio’, I went the dry cleaner next door and he dried them for me. I needed broccoli for dinner, so went 2 blocks to Marks and Spencers had it within 5 minutes. The center of town is all pedestrian only and because this is a tourist destination there are many and varied shops, some international like Body Shop and other small locally owned shops. Driving will take some time. It is really crazy here. We did buy a car Saturday from a local gal at a hair salon, suggested by our landlady. It is a Peugeot 206 Quicksilver, which meant nothing to me, but it is cute, a reasonable price and will suit us just fine. So now to build up my confidence and overcome my fear of going the wrong way or getting lost. The roads are super narrow and things don’t make sense to me, but I have the Highway Code book, which I am reading and will slowly have Mostyn and probably a professional teach properly how to drive here. Everything takes longer than we are used to here, so I am getting used to a much slower pace with a flexible schedule and allowing extra time to do things. Washed dark clothes today as the sun is out after a fierce storm in the night. It takes over an hour sometimes 2 for the wash to finish. So I put the clothes in and went for a walk on the wall, but got lost and but found my way back home in time for the wash to be done, and ready to hang out to dry, which will take all day and may need extra time overnight to dry on a rack. See what I mean! 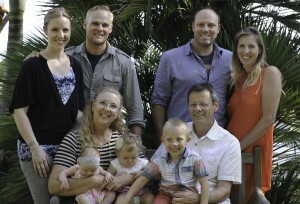 Missing my kids and grandkids fiercely but have had several Facetime calls with them and that helps to stay connected. Owen sang to me yesterday, my heart melted. We will be going north to Reading in 2 weeks to see our great nephew, Huw, dedicated to the Lord. Looking forward to seeing family and getting some more good info and advise from Mostyn’s sister about where best to shop, get fabric, yarn, and general info about life in England. Had an amusing experience at a small church we attended Sunday. They all seem to serve to coffee and tea and expect you to stay and visit, so we did and one dear mentally challenged woman was so excited we were Americans. She apparently is in love with Metallica (a heavy metal band), and wanted to know if she could send them biscuits and if they would like that!! As if I would know. I was gracious and said I was sorry I did not know them personally, nor did I listen to their music. Postage here is very expensive, so I hope she does not waste her money!! Well these are my initial thoughts for now. Sorry I have no photos, like Mostyn does in his blog posts. I finally entered Chichester on Sunday afternoon, Sep 7th. 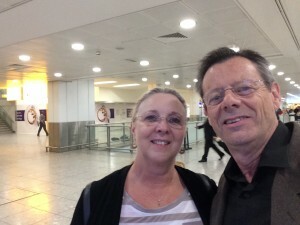 It was a long travel day(s) – stopped over at JFK for a few hours and then once finally reaching London, Heathrow, it took about an hour before I was walking out of the airport. 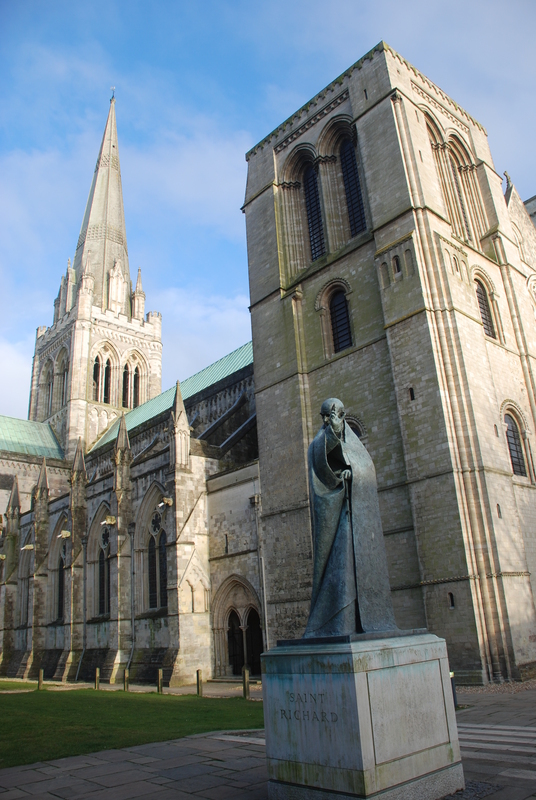 Then it was a two hour drive southwest to Chichester, arriving around 2 PM local time – 21 hours total travel time. I didn’t get much sleep on the planes (a few nods) but since it was still afternoon when I arrived I didn’t think it wise to go to sleep right away – trying to acclimatize myself to the new time zone – so I unpacked my suitcase and wandered the town a bit. 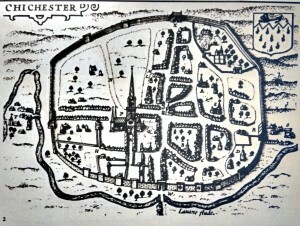 A map of Chichester drawn around 1610. 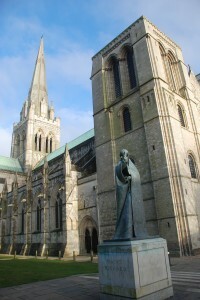 Chichester is 70 miles southwest of London, 30 miles west of Brighton along the south coast of England. 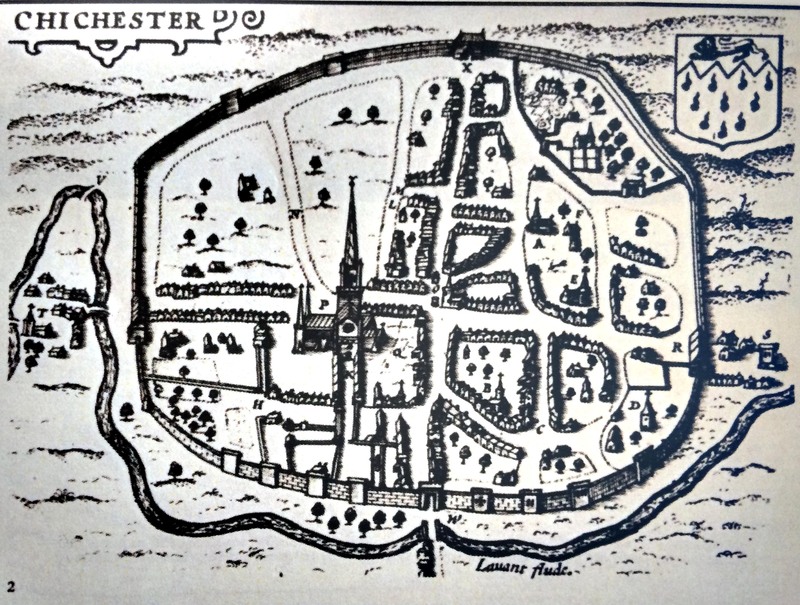 It is a very old town – originated by the Romans in the first century. 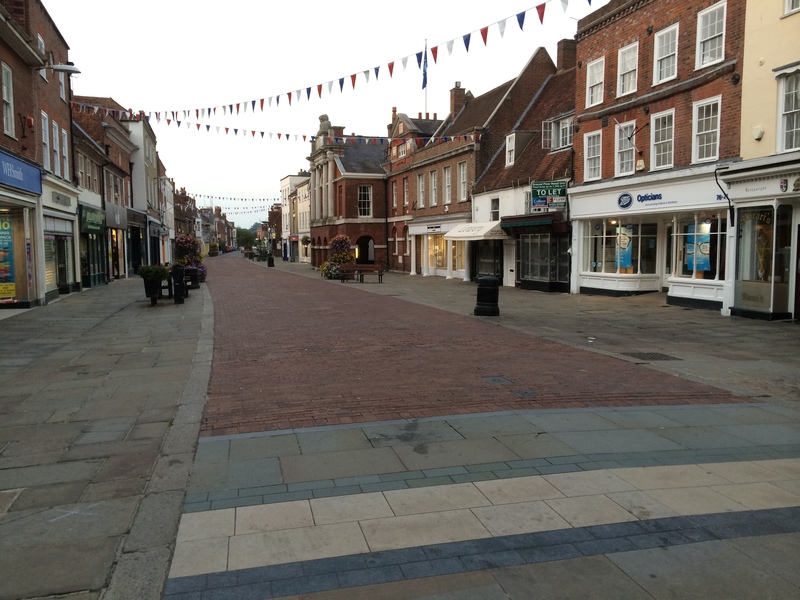 They called it Noviomagus Regnensium, which could be translated Newmarket of the Regni tribe. It is constructed as a circle with the main streets running North-South and East-West – just like dividing a pie into four parts. The streets are aptly named, North, South, East, and West Streets and the entrances along those streets into town are called, North Gate, South Gate, etc. We live on North Walls street – you can figure out where it is. We are not far from the North Gate along the north wall. The walls actually weren’t built until the 3rd century. 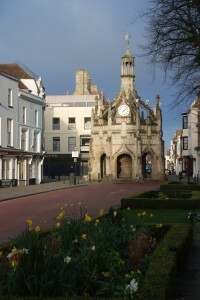 Two other distinctive features of the town are its cathedral and it market cross. The cathedral, constructed between 1076 and 1108, seems way out of place for such a small town. It is massive compared to anything else in the town. To give you a feeling for how small it is, I walked from North gate to south Gate in ten minutes at a very casual pace. 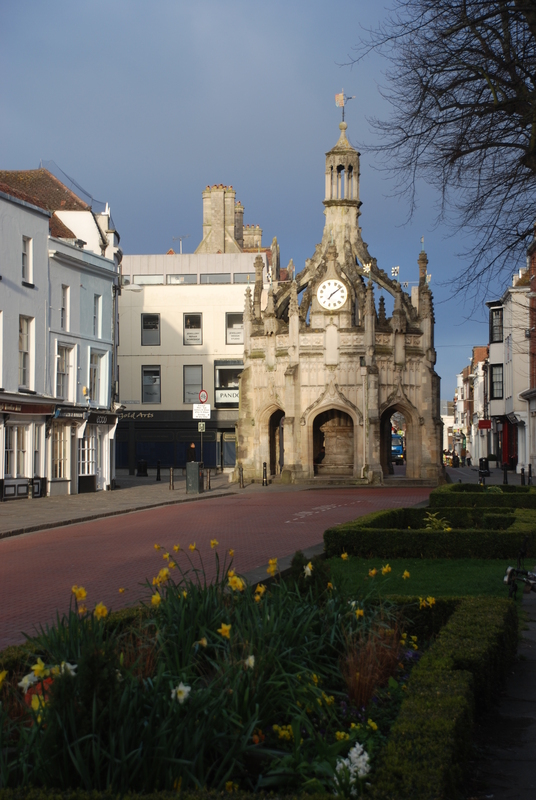 The market cross is situated right at the cross roads of the two main streets and was built in 1501 to provide shelter for poor market traders who were unable to afford a market stall of their own. 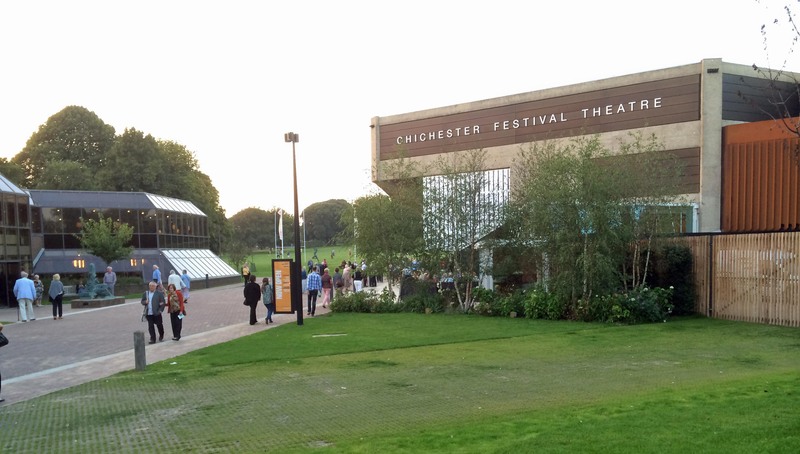 Chichester also has a modern day significance, it is the home of the Chichester Festival Theatre, the University of Chichester and the Goodwood Motor Circuit. 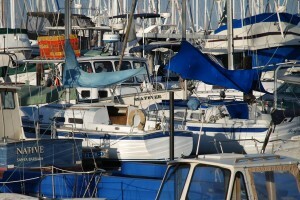 All of which are less than a couple miles from the town centre. The theatre is less than 5 minutes walk from our flat. It was opened in 1962 with Laurence Olivier as its inaugural Artistic Director. The University has its roots in Bishop’s Training College which was founded in 1839 in honor of Bishop William Otter. 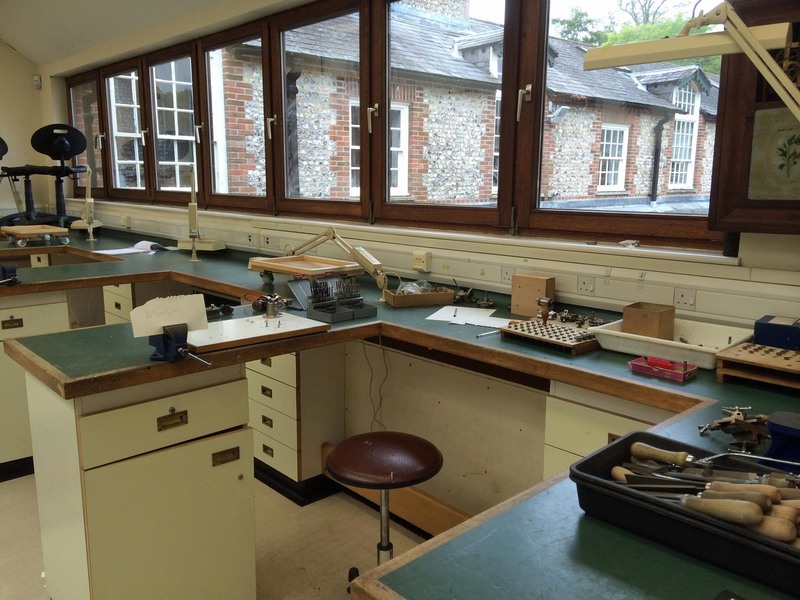 One of the lecture rooms at the college was used as the one of the operations rooms for the RAF during the D-Day landings in 1944. It gained University status in 2005 and has just over 5000 students. The Goodwood Motor Circuit opened in 1948 around an RAF airfield that was used in the 2nd World War. In 1966 is stopped being used as a premier modern racing arena but continued to be used as a test circuit. Then in 1998, a reenactment of its original opening 50 years prior was held – such an effort was made to restore the circuit to how it looked when it first opened that it has turned into and annual tradition. The Goodwood Revival has established itself as the world’s most popular historic motor race meeting, and the only event of its kind to be staged in the romantic time capsule of the Fifties and Sixties. It just happens that this years’ Revival is being held this weekend coming up – the town will be crazy with visitors I am sure. Obviously, this is not the Motor Circuit (I haven’t been there yet.) This is an old canal that leads from the town to the Chichester Channel and the sea about five miles away. It was a major form of transportation for goods in early 1800s. Today they use the boats for dinner rides. 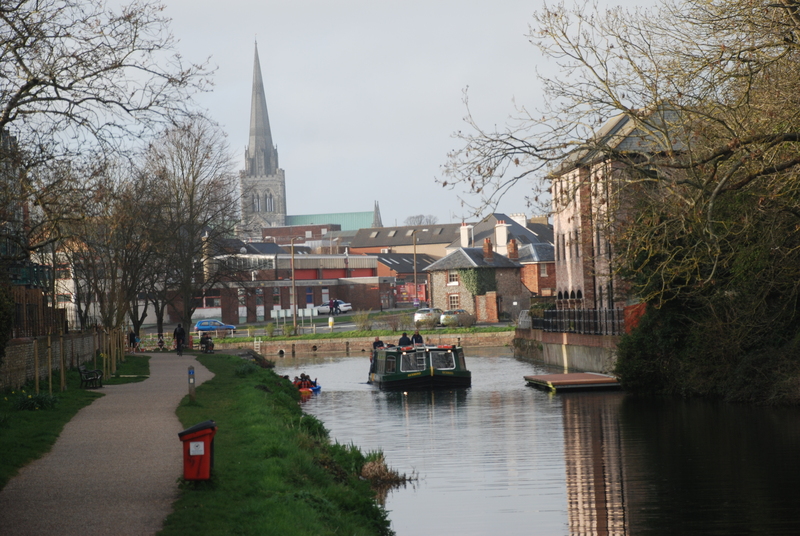 You can see the cathedral spire from everywhere in town and from quite a distance away. And all that says nothing about West Dean College which is where I am going to school – I’ll write a note on West Dean a little later but I think that’s enough for today. BUT we have much to do in England before school starts. We need to get new cell phones plans, open a bank account, buy a car and bicycle, get all our belongings shipped and in place. Then there is the school stuff – I have shipped my mini-lathe and need to get that set up in the school workshop along with the rest of my tools, and – I also need to discuss a Masters project with my tutor. This is the most critical part of the work of the year for me and the most interesting part. So, it’s wheels up on Sat the 6th (today)for me. I will take a standby flight to JFK and then the last hop from JFK to London Heathrow, arriving there in Sunday morning. Sitting on the runway at JFK in a line of 18 planes waiting for takeoff. 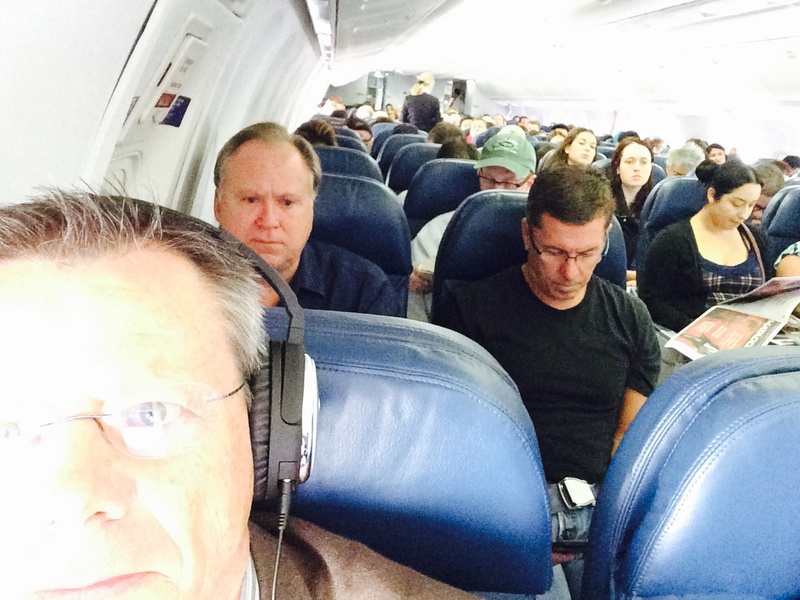 We have spent almost a year preparing for this trip to England and we are just about ready to take off. On Labor day we officially left the house with everything packed and ready to ship as well as suitcases to carry with us. The renters moved in on 2 Sep, so we had to be out of the house BUT Debbie’s Certificate of Entitlement has not come in yet so, we are officially homeless – all dressed up and no where to go! It is nice to have family and friends though. 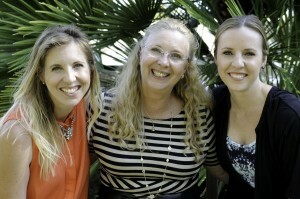 We are currently staying with our daughter Heather’s in-laws in Newport Beach. They are so gracious to let us stay with them until we can make our next step. We have heard from our immigration lawyers in NY who are doing their best to expedite Debbie’s application. Looks like it could be a few weeks before we receive her papers. We are thinking strongly about me going ahead before Debbie to begin the process of settling in and then letting Debbie follow when her Certificate does come through. Me & Deb after 40 years! Last weekend Debbie and I celebrated 40 years of marriage. Our actual anniversary is today, the 24th of August, but given all the preparations for our trip we thought this was the best time to celebrate. It was probably the best celebration/party I have ever had! No, it wasn’t wild and crazy but it was tremendously meaningful. It was a wonderful reward for the result of 40 years of commitment. We, like everyone, have had our rough days, but both of us would say that we are in the best time of our lives. Debbie, thanks for hanging in there with me – you have truly made me a better man and given me such great kids. I love you more today than ever! It was a very simple affair – the girls organized some snacks and set everything up in a very elegant way. People came and mingled for a while then we had a simple sharing of thoughts from the kids and Debbie and myself. Important times call for important things to be said – and they were. After sharing, we sang a few songs that we sometimes sing at church on Sunday. And that was it. 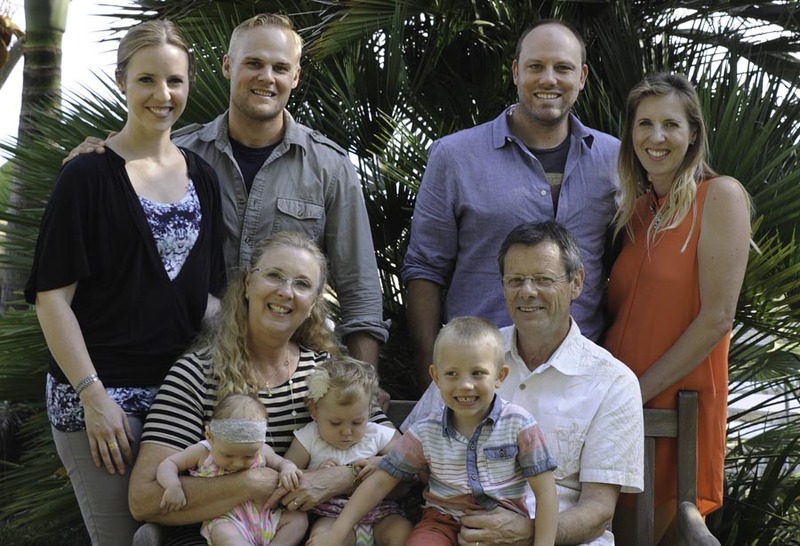 My primary focus for the day was to thank God for his blessing in our marriage, giving us such great girls and grand kids, leading us these 40 years, and filling our lives with great joy. I feel that in no way has it been because of our wisdom or goodness as people that we have made it this long – it is only because God has helped us. We’re thankful! If an adventure was what we were looking for that is what we have – and we have not even left the country yet. In addition to my pursuit of a clock making education, this year away is also providing a much deserved career break for my wife, Debbie. After all, she has been working steadily for longer than I have, starting in 1979. 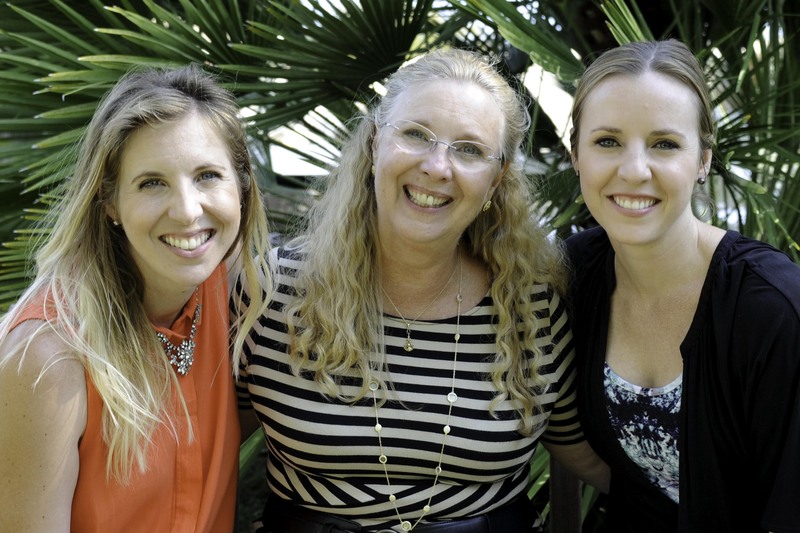 She helped me get through school at UCSB (BSEE) and has continued to work as a dental hygienist for all these years. So far we have had a real adventure just learning about the British immigration rules. Their immigration law is probably as strict as ours but also has some quirks. 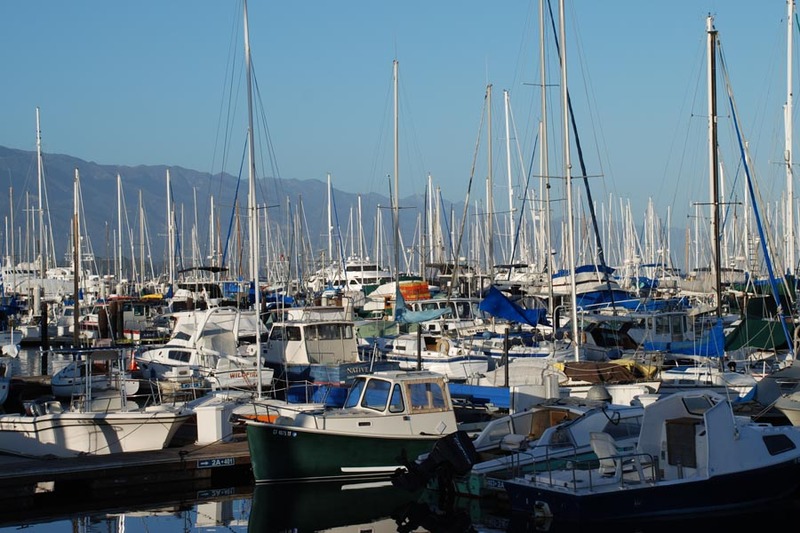 Our experience has been just about as easy as making our way through this tangled mess of boats in the Santa Barbara harbour (note the British spelling). Apparently, for me to bring her into the UK as a dependent of a student would have required that my course be at least 12 months long – mine is one week short of that. Close does not count for UK Immigration. If my course was less than 6 months or at least 12 months, then it would not have been a problem – are you kidding? In addition, my degree would need to be offered by a school known as a “Recognized Body”. Again, NO, my school is only a “Listed Body”. In addition to not seeing a way forward for Debbie, we had not rented our house in Santa Barbara yet and I told the school that I may not be coming after all. We kept our heads down and forged on as if we didn’t know any better. One day, we were showing our house to potential renter, explaining our situation with UK immigration. They said that they had worked with a good immigration lawyer in NY. Having already called several immigration lawyers in England, I was not too hopeful but made the contact anyway. The initial contact confirmed what we already knew; taking Debbie as a student dependent would not work BUT our discussion led to other methods of entry to the UK. Turns out that because Debbie’s father was born in Scotland, she is something akin to being a British Citizen by birth. All she needs to do is apply for a Certificate of Entitlement that gives her the “Right to Abode”. She can be in the UK for as long as she wants, any time she wants! Sometimes when you back away and get some perspective, things look a little more clear. So, now we are both in process for obtaining our visas in the next couple weeks. AND we have just signed some wonderful renters to take our house for the time we are away. The reality is settling in – we have 27 days, including four weekends left to get ourselves fully ready – are you kidding? Wow! Almost time to drink to the success of just getting started. Sit Back, Relax, and Enjoy the Ride! Over the next 18 months we will be taking you on an adventure to England where I will be studying clock restoration and conservation. 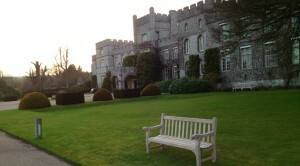 Officially, I will be getting a Master’s degree in Conservation Studies from West Dean College near Chichester. If you followed my blog last year as I went on a clock tour of France, you might remember that I started my trip by visiting West Dean College for an acceptance interview. All worked out well with that interview, I have been accepted and am now preparing to start school in the fall, just a few short months away. So, let me take you to the front lawn of the college where you will see a nice comfortable bench calling your name. We’re at the front entrance to the college. Why don’t you take a seat – sit back, relax, and enjoy the ride–this is going to be a long adventure. From here you can enjoy the great big field in front of the college. Many times there are sheep just wandering the fields. Enjoy the view — while I get back to my preparations. We have 114 days including 17 weekends before we leave. My wife Debbie will be coming with me, at least for part of the time, but that’s a long story that I will probably get to sometime along this tour. If you want to follow along with me, just send me a email by clicking on the “Subscribe” button on the top right of this page.